Dionysius of Halicarnassus (Greek: Διονύσιος Ἀλεξάνδρου Ἁλικαρνᾱσσεύς Dionysos Alexandrou Alikarnasseus; "Dionysios son of Alexandros of Halikarnassos"; c. 60 BC – after 7 BC) was a Greek historian and teacher of rhetoric, who flourished during the reign of Caesar Augustus. His literary style was Atticistic — imitating Classical Attic Greek in its prime. Dionysius' opinion of the necessity of a promotion of paideia within education, from true knowledge of Classical sources, endured for centuries in a form integral to the identity of the Greek elite. He was a Halicarnassusian. At some time he moved to Rome after the termination of the civil wars, and spent twenty-two years studying Latin and literature and preparing materials for his history. During this period, he gave lessons in rhetoric, and enjoyed the society of many distinguished men. The date of his death is unknown. In the 19th century, it was commonly supposed that he was the ancestor of Aelius Dionysius of Halicarnassus. His great work, entitled Ῥωμαϊκὴ Ἀρχαιολογία (Rhōmaikē archaiologia, Roman Antiquities), embraced the history of Rome from the mythical period to the beginning of the First Punic War. It was divided into twenty books, of which the first nine remain entire, the tenth and eleventh are nearly complete, and the remaining books exist in fragments in the excerpts of the Roman emperor Constantine Porphyrogenitus and an epitome discovered by Angelo Mai in a Milan manuscript. The first three books of Appian, Plutarch's Life of Camillus and Life of Coriolanus also embody much of Dionysius. His chief object was to reconcile the Greeks to the rule of Rome, by dilating upon the good qualities of their conquerors and also by arguing, using more ancient sources, that the Romans were genuine descendants of the older Greeks. According to him, history is philosophy teaching by examples, and this idea he has carried out from the point of view of a Greek rhetorician. But he carefully consulted the best authorities, and his work and that of Livy are the only connected and detailed extant accounts of early Roman history. On the Character of Thucydides (Περὶ Θουκυδίδου χαρακτῆρος Perì Thoukydídou charaktêros). The last two treatises are supplemented by letters to Gn. Pompeius and Ammaeus (two). Dionysian imitatio is the literary method of imitation as formulated by Dionysius, who conceived it as the rhetorical practice of emulating, adapting, reworking, and enriching a source text by an earlier author. 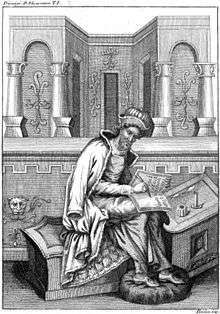 Dionysius' concept marked a significant departure from the concept of mimesis formulated by Aristotle in the 4th century BC, which was only concerned with "imitation of nature" and not "imitation of other authors." Latin orators and rhetoricians adopted Dionysius' method of imitatio and discarded Aristotle's mimesis. Dionysius is one of the primary sources for the accounts of the Roman foundation myth and the myth of Romulus and Remus. He was heavily relied upon for the later publications of Livy and Plutarch. He writes extensively on the myth, sometimes attributing direct quotes to its figures. The myth spans the first 2 volumes of his Roman Antiquities, beginning with Book I chapter 73 and concluding in Book II chapter 56. Dionysius claims that the twins were born to a vestal named Ilia Silvia (sometimes called Rea). Her family descends from Aeneas of Troy and the daughter of King Latinus of the Original Latin tribes. Proca, her grandfather had willed the throne to his son Numitor but he was later deposed by her uncle, Amulius. For fear of the threat that Numitor's heirs might pose, the king had Ilia's brother, Aegestus killed and blamed robbers. The truth about the crime was known by some, including Numitor, who feigned ignorance. Amulius then appointed Ilia to the Vestal priestesshood, where her vow of chastity would prevent her from producing any further male rivals. Despite this, she became pregnant a few years later, claiming to have been raped. The different accounts of the twins' conception are laid out, but Dionysius declines to choose one over the others. The sources variously relate that it was a suitor, Amulius himself (in full armor to conceal his identity and , or a supernatural being. The latter comforted Ilia by making her grieve and telling her that she would bear twins whose bravery and triumphs would be unmatched. Ilia hid her pregnancy with claims of illness so as to avoid her vestal duties. Amulius suspected her and employed physicians and his wife to monitor her for signs of being with child. When he did discover the truth, she was placed under armed guard. After being informed of the delivery of the twins, Amulius suspected that she had in fact given birth to triplets. The third child had been concealed from the guards present. Ilia was either put to death, or kept secretly in a hidden dungeon for the rest of her life. Citing Fabius, Cincius, Porcius Cato, and Piso, Dionysius recounts the most common tale. The king orders the twins to be tossed into the Tiber. When his servants arrived at the riverbank, high waters had made it impossible to reach the stream. They left the twin's basket in a pool of standing water on the site of the ficus Ruminalis. After the waters of the Tiber had carried the twins away, their basket is overturned by a rock and they are dumped into the mud. A she-wolf finds them there and nurses them in front of her lair (the Lupercal). Plutarch places the Lupercal as at the foot of Palantine hill along the road to the Roman chariot grounds and was the source of a natural spring. The twins were discovered by unnamed herdsmen, and when they arrive, the she-wolf calmly retreats into the cave. Faustulus, the man in charge of the royal abattoir, happened upon the scene. He had heard the story of Ilia's twin birth and the king's order, but never let on that he suspected the foundlings were one and the same. He persuaded the shepherds to allow him to take the boys home, and brought them to his wife, who had just delivered a stillborn child. Later, quoting Fabius' account of the overthrow of Amulius, Dionysius claims that Faustulus had saved the basket in which the boys had been abandoned. As they grew, the boys exhibited the graces and behavior of the royal-born. They passed their days living as herdsmen in the mountains, spending many nights in huts of reeds and sticks. Dionysius relates an alternate, "non-fantastical" version of Romulus and Remus' birth, survival and youth. In this version, Numitor managed to switch the twins at birth with two other infants. The twins were delivered by their grandfather to Faustulus to be fostered by him and his wife. Faustulus was descended from the first Greek colonists in Latium. He was the caretaker for Amulius' holdings around Palatine hill. He was persuaded to care for the twins by his brother Faustinus, who tended the kings herds on nearby Aventine hill. Their adopted mother was Faustulus' wife Laurentia, a former prostitute. According to Plutarch, lupa(latin for "wolf") was a common term for members of her profession and this gave rise to the she-wolf legend. The twins receive a proper education in the city of Gabii. According to Fabius, when the twins were 18, they became embroiled in a violent disputes with some of Numitor's herdsmen. In retaliation, Remus was lured into an ambush and capture while Romulus was elsewhere. In Aelius Tubero's version, the twins were taking part in the festivities of the Lupercalia, requiring them to run naked through the village when Remus, defenseless as he was, was taken prisoner by Numitor's armed men. After rounding up the toughest herdsmen to help him free Remus, Romulus rashly set out for Alba Longa. To avoid tragedy, Faustulus intercepted him and revealed the truth about the twins' parentage. With the discovery that Numitor was family, Romulus sets his sights on Amulius, instead. He and the rest of his village set out in small groups toward the city so that their arrival will go unnoticed by the guards. Meanwhile, after being turned over to Numitor to determine his punishment, Remus was told of his origins by the former king and eagerly joins with him in their own effort to topple Amulius. When Romulus joined them at Numitor's home, the three of them began to plan their next move. Back home, Faustulus had begun to worry about how the twins' claims will be heard in Alba. He decides to bolster them by bringing the basket in which they were abandoned to the city. He's stopped by suspicious guards at the gates and he and the basket are seen by none-other-than the servant who had taken them to the river those many years before. Under the questioning of the king, and after the king's insincere offers of benevolence toward his nephews, Faustulus, trying to protect Romulus and Remus, and escape the king's clutches, claimed he had been bringing the basket to the imprisoned Ilia at the twins request and that they were at the moment tending their flocks in the mountains. Amulius sent Faustulus and his men to find the boys. He then tried to trick Numitor into coming to the palace so that the former king could be kept under guard until the situation had been dealt with. Unfortunately for the king, the man he sent to lure Numitor into his clutches instead revealed everything that had happened at the palace. The twins and their grandfather led their joint supporters to the palace, killed Amulius, and took control of the city. Plutarch continues the same alternate version of the twins' parentage and youth. After the boys had returned home from their studies in Gabii, Numitor has the twins attack his own herdsmen and drive off his own cattle to contrive a complaint against his brother. To placate him, Amulius ordered not only the twins to be brought to the palace for trial, but all the others who were present, as well. This is exactly what Numitor had hoped for. When Romulus and Remus arrived in Alba, their grandfather revealed their true identity and he, the twins and the other herdsmen joined forces to attack Amulius, apparently killing him. The now re-installed King Numitor granted Romulus and Remus control over the area around where Rome would be founded, and sent some of Alba Longa's commoners and nobles along with them. These included volunteers as well as his enemies, and other troublemakers and 50 families of the descendants of the Greeks who had settled in Italy after the Trojan War. The commoners were given provisions, weapons, slaves and livestock. Wanting to use competition to better complete the many tasks ahead of them, each twin took command of half of the new group of colonists and natives. Instead, the two groups each wanted their twin to be king. Eventually, both Romulus and Remus began to harbor their own ambitions of being the sole ruler of the new city. Things came to a head when a dispute broke out over the particular hill upon which Rome should be built. Romulus wanted to build on Palatine Hill for it's significance to their childhood. Remus chose Aventine Hill for its strategic advantages. Finally, with no resolution in site, they took the matter to Numitor. He told each twins to stake out a spot on an appointed morning at dawn and wait for a "bird omen" from the gods to settle things. They took his suggestion and the two brothers took their positions along with guard to prevent cheating. No birds appear to Romulus, but he tries to trick Remus by sending a message that he should come to him right away. Ashamed, the messengers take their time, and while en route, Remus sees 6 vultures. The messengers bring Remus back to his brother and when they arrive, Romulus is asked what type of bird he had seen (apparently owing to the ruse). Unsure, Romulus is suddenly saved by the sudden arrival of 12 vultures. He dismissed his brother's query and declared himself the winner. Furious Remus refused to accept defeat. This reignited the conflict between them. Outwardly, the twins both acknowledged the other's claim to having won. Remus by seeing the vultures first, and Romulus by seeing more of them. Privately, however, neither was willing to give in. An armed battle broke out between their followers resulting in deaths among both. Faustulus was so distraught over his inability to end the strife between his adopted sons that he threw himself into the middle of the fighting and was killed. Remus also falls. Romulus is devastated at his personal losses as well as the many suffered by the twins' followers. Only after the intervention of Laurentia is he able to return to the job of founding the city. Other sources who are unnamed by Plutarch claimed that despite his anger over Romulus' conduct during the contest of the augury, Remus conceded and the construction of the city began on Palatine Hill. Out of resentment, he derided the city's newly-built walls and demonstrated their ineffectiveness by leaping over them, saying that an enemy of Romulus could do the same. In response, Celer, the job's foreman killed him on the spot with a blow to the head and implies that Remus himself had become his brother's enemy. Before construction on the city began Romulus made sacrifices and received good omens, and he then ordered the populace to ritually atone for their guilt. The city's fortifications were first and then housing for the populace. He assembles the people and gives them the choice as to what type of government they want. After his address, which extols Bravery abroad war and moderation at home, and in which Romulus Denies any need to remain in power, the people decide to remain a kingdom and ask him to remain its king. Before accepting he looks for a sign of the approval of the gods. He prays, and witnesses an auspicious lightning bolt, after which he declares that no king shall take the throne without receiving approval from the gods. He divides Rome into 3 tribes, each selected a Tribune in charge of each. Each tribe was divided into 10 Curia, and each of those into smaller units. He divided the kingdoms land holdings between them. Plutarch suggests that Athenian institutions were the inspiration for Romulus' creation of the Patrician class from the wealthy and virtuous. Other sources cited claim All others Roman's formed the Plebeian class. The Patricians were put in charge of religious, legal and civil institutions, while the Plebs were to be farmers, herders and tradesmen. Each curiae was responsible for provided soldiers in the event of war. To maintain order, every pleb had the right to chose a Patrician in a system of patronage (clientela). All patrons (patronus) were required to protect the rights and interests of those plebs (cliens) beneath them. In return all plebs were required to support his patron in his endeavors and assist him when needed. It was illegal for either party to testify against one another or otherwise act against the interests of the other. Romulus then proceeded to establish the senate. Another act that Dionysius attributes to Greek influence. He selected 300 of the strongest and fittest among the nobles to become his personal bodyguard and messengers. The celeres were so-named either for their quickness, or, according to Valerius Antias, for their commander. These were the first Roman cavalry and were instrument in many Roman victories. Romulus then delimited the various powers of the institutions he had created. 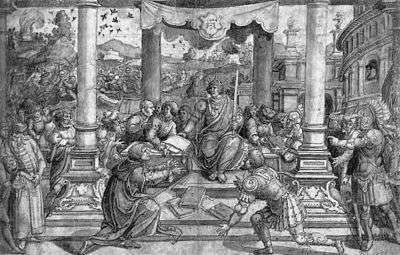 The Roman king was made the ultimate authority in all religious and legal matters. He would personally hear the cases of "the greatest crimes" but after reaching a decision, his opinion would be subject to approval by the people. He would be the commander in chief of the military in wartime. The senate would have the power to decide any matter or issue brought to them by the king with a binding vote (attributed by Dionysius to the Lacedaemonians. The popular assemblies had the power to elect magistrates, pass laws and declare war at the king's discretion. Romulus passed laws meant to encourage child-rearing. He welcomed free men of any background to settle in the new city with promises of citizenship and an offer of protection from those from home who might be pursuing them. Immigrants flocked to Rome as a result. Rome would also benefit from their practice of sending colonists to newly-conquered cities and allowing the subjugated to carry on as they had before. More common in the Greek world was to treat those they defeated harshly. Rome grew 10 during Romulus' reign. In an extensive exploration of the various, lurid traditions of the day, Dionysius effusively praises the manner in which Romulus' organized and established Rome's religious customs and practices. He attributes to the king everything from the founding of temples, to defining the sphere of individual gods, their festivals and the blessings they would each bestow. Among the Greek and native traditions, he kept only those he deemed worthy and rejected any that were too unseemly or otherwise unfit for Roman society. According to Terentius Varro, Romulus appointed a large number of Roman men and women to religious office during his reign. He also allowed the various curia to select their own. He adopted the greek practice of appointing children to participate in the city's ceremonies. He established an office of augury, who would ensure the approval of the gods during all worship undertaken. Each curia was required to sacrifice and give offerings in a way so specified. He established budgets for religious practice in the city. Again, Dionysius thorough describes the laws of other nations before contrasting the approach of Romulus and lauding his work. The Roman law governing marriage is, according to his Antiquities an elegant yet simple improvement over that of other nations, most of which he harshly derides. By declaring that wives would share equally in the possessions and conduct of their husband, Romulus promoted virtue in the former and deterred mistreatment by the latter. Wives could inherit upon their husband's birth. A wife's adultery was a serious crime, however, drunkenness could be a mitigating factor in determining the appropriate punishment. Because of his laws, Dionysius claims, not a single Roman couple divorced for the next 5 centuries. His laws governing parental rights, in particular those that allow fathers to maintain power over their adult children were an improvement over those of others. Under the laws of Romulus, native-born free Roman's were limited to two forms of employment: farming and the army. All other occupations were filled by slaves or non-roman labor. Romulus used the trappings of his office, to encourage compliance with the law. His court was imposing and filled with loyal soldiers and he was always accompanied by the 12 lictors appointed to be his attendants. According to Gnaeus Gellius, in Romulus' fourth year in power, the recently founded city of Rome, its population swollen with immigrants found itself surrounded by unfriendly neighbors and short of marriageable women. Romulus sought to solve both problems through intermarrying with the other cities in the region, but he was rebuffed. His solution having been approved by his Grandfather, received the auspices of the gods, and the support of the senate began with the announcement of a spectacular festival and competitions to honor the god Neptune, and to which all of Rome's neighbors were welcome. They came from far and wide, sometimes entire families, to attend and participate. On the king's signal, Romans began abducting the young women in attendance much to the shock and horror of their guests. Later, the women are brought before him where he assures them that he and the other men of Rome intend to honorably marry them and that they won't be sexually exploited in anyway. This eases their fears. The cities of Caenina, Crustumerium, and Antemnae petition Tatius, king of the Sabines to lead a joint attack in response to the kidnappings. Their goal was stymied by Rome's own diplomatic efforts and the other three cities eventually concluded that Tatius was delaying any action on purpose. They decide to attack Rome without the Sabines and their armies are defeated and their cities captured each in turn. The wars that resulted from the mass abduction committed by the Romans came to a climax in an epic battle fought at the foot of the Capitoline Hill. After the Sabines had captured the Roman Citadel through guile, they occupied the most strategically important point in the city with the help, knowing or otherwise, of Tarpeia. After several skirmishes and minor engagements, the armies fought two pitched battles featuring valor and losses to both sides. 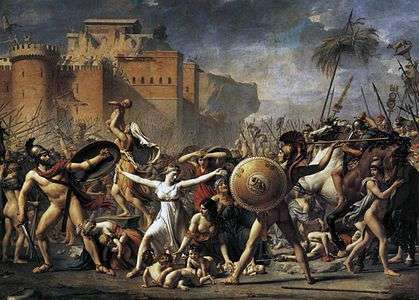 The Intervention of the Sabine Women, by Jacques-Louis David, 1799. In the course of the battle, both sides found themselves on the verge of defeat, only to turn the tide back in the nick of time. Romulus himself was injured by a rock to the head. The fighting ceased only by the coming of dusk. Afterwards, the Sabine women, led by the noble Hersilia, convinced the two kings to make peace. After a ceasefire, the nations agreed to become a single kingdom under the joint rule of Romulus and Tatius. The city was expanded and its institutions were adjusted to accommodate the new increase in population and to demonstrate their mutual good will. The joint kingship lasted for four years until the death of Tatius. During this time they conquered the Camerini and made their city a Roman colony. The two peoples are merged under a joint throne with Rome as the capital. The Sabines and Romans alike were then declared Quirites, from the Sabine city of Cures. To honor the Sabine women, when Romulus divided the city into 30 local councils, he named them after the women. He also recruits three new units of knights and called them Ramnenses Tatiensis (from the two kings names). Some of Tatius' friends victimized some Laurentii and when the city sent ambassadors to demand justice, Tatius would not allow Romulus hand over the perpetrators over to them. A group of Sabines waylay the ambassadors as they sleep on the way home. Some escape and when word gets back to Rome, Romulus promptly turns the men respsonsible--including one of Tatius' family members--over to a new group of ambassadors. Tatius follows the group out of the city and frees the accused men by force. Later, while both kings are participating in a sacrifice in Lavinium he is killed in retribution. The account of Licinius Macer recounts that Tacitus was killed when he went alone to try and convince the victims in Lavinium to forgive the crimes committed. When they discovered he had not brought the men responsible with him, as the senate and Romulus had ordered, an angry mob stones him to death. After his rule had turned more dictatorial, Romulus met his end. Either through actions divine or earthly. According to some reports, Romulus is swept up into heaven, where he takes his place among the gods as Quirinus. Others point to the hands of the nobility, who had grown ever more resentful of their treatment by king. 1 2 T. Hidber. Encyclopedia of Ancient Greece (p.229). Routledge 31 Oct 2013, 832 pages, ISBN 1136787992, (editor N. Wilson). Retrieved 2015-09-07. 1 2 One or more of the preceding sentences incorporates text from a publication now in the public domain: Chisholm, Hugh, ed. (1911). "Dionysius Halicarnassensis". Encyclopædia Britannica. 8 (11th ed.). Cambridge University Press. pp. 285–286. ↑ Dionysius of Halicarnassus. "The Roman Antiquities (Loeb Classical Library edition, 1937), Book 1, 11". Penelope, University of Chicago. Retrieved January 12, 2013. A full bibliography of the rhetorical works is given in W. Rhys Roberts's edition of the Three Literary Letters (1901); the same author published an edition of the De compositione verborum (1910, with trans.). Maximilien Egger, Denys d'Halicarnasse (1902). Otto Bocksch, "De fontibus Dion. Halicarnassensis" in Leipziger Studien, xvii. (1895). Cf. also J. E. Sandys, History of Classical Scholarship i. (1906). Casper Constantijn de Jonge, Between grammar and rhetoric: Dionysius of Halicarnassus on language, linguistics and literature Leiden: Brill (2008).